If you’ve ever searched for a timeless perfume to add to your collection, this chapter in the fashion house’s history is one to tap into. Inspired by the enchanting art of alchemy and its influence on the tradition of fragrance making, the new luxury scent collection, designed by master perfumer Alberto Morillas and Gucci creative director Alessandro Michele, includes seven eaux de parfum, four perfumed oils, three acque profumate and a scented candle, replete with apothecary-style lacquer bottles. Together the duo sought to create The Alchemist’s Garden, capturing the persuasive nostalgia of a scent. “The idea that some primary scents of perfumery, like the essences of the flowers, the green scent of some plants could be joined to atmospheres, linked to memories. And also link to the idea that a perfume in an alchemical way can through a scent bring you back to a different place, through a sense so strong and so important for every human being,” Michele says of the collection’s key concept. Morillas keenly carries out Michele’s vision for an emotive collection that uses pure, natural elements with modern molecules. If Morillas and Michele are the gardeners, the lucky wearer is the florist who can arrange the scents however they please. Each of the eaux de parfums feature a hero ingredient: Oud, Amber, Violet, Iris, Mimosa, Rose and Woods, which tell their own unique tale of a distinct place, a moment, a season and the scent of a memory. The singular scents are buildable and customisable with the acque profumate and oils for a transformative experience meant to conjure a unique sillage—the amount the perfume lingers in the air when it is worn. The collection’s 14 bottles are housed in apothecary-inspired bottles with animal symbols and gold lettering adorning the seven eaux de parfum glass lacquer bottles. 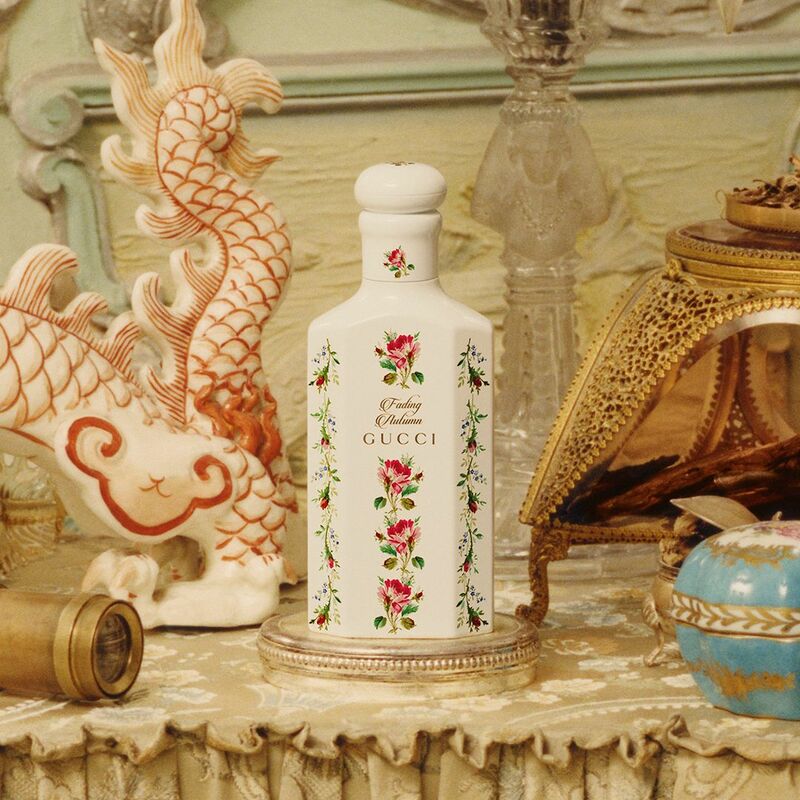 The acque profumate are clad in elegant white lacquer glass bottles decorated with Gucci’s whimsical pink rose print while the aromatic oils come in an eye-catching sage green glass. Magnify or mute the other fragrances with the scented candle, which is diffused with the scent of The Virgin Violet, and sits beautifully in a white porcelain jar, richly decorated with real gold. Together the collection creates a decidedly sophisticated display with just the right amount of whimsy. Delivered in a keepsake box with a moiré pouch, The Alchemist’s Garden is just what one needs to saunter auspiciously into a brand new year.